Born and bred in the diminutive State of Connecticut, adventurepdx (aka Shawn Granton) has been living in Portland, Oregon, Cascadia, for almost two decades. Freelance artist and writer by trade. Self-publishing comics since 1996, first TEN FOOT RULE and now NEW OLD STOCK. Involved with the bicycle community in town and rides almost everywhere he can, but also loves riding trains. Loves bike touring! Occasionally puts on Bike Touring Workshops. Lives in a modest house somewhere around the North Tabor neighborhood of NE Portland. We had an extended break in Oregon City. First, we toured through downtown and took a ride up to bluff level via the (in)famous Oregon City Municipal Elevator. 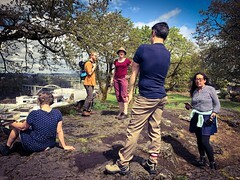 We cruised along the Promenade and climbed a small rocky outcropping to get a magnificent view of Willamette Falls, largest waterfall (by volume) in the Northwest. After this we had food and drink at the Highland Stillhouse, a Scottish Pub. After our final viewing of the falls, we bombed down busy 99E back into downtown Oregon City. 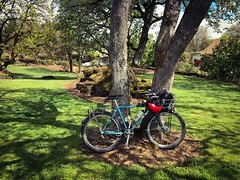 We rode back the same way until the Clackamas River crossing, then took the I-205 bike path. If I was going to do this ride differently, I probably would have taken the Trolley Trail back. But I like a good “loop” route, and trying to loop back via the west side of the Willamette is not ideal, with busy roads and some serious hills. The 205 path is serviceable, but lacks scenery, and like most “bike paths paralleling a freeway”, gets noisy. But it was pretty fast going. After that, the few of us remaining (meaning myself, Emee, and Maria) ended the endeavor in the Montavilla neighborhood, where we enjoyed beer at the eponymous brewpub. My cyclometer read 33 miles by the time we stopped. A good long ride on a three speed! Reminder: Sturmey Archer Hub Overhaul Workshop is Wednesday! Hello friends of Three Speeds! Just a reminder that our first workshop, the Sturmey Archer Hub Rebuild Workshop, is just two days away. And while we’ve sold half of the spots, we still have space available for you! This class will be taught by expert mechanic Patrick Loftus, who has overhauled many an AW hub in his day. It will be held at the Community Cycling Center (1700 NE Alberta St) on Wednesday April 24 at 7 pm. Learn how to overhaul a Sturmey Archer three speed hub! Veteran bike mechanic Patrick Loftus will open up an AW hub, dismantle it, and reassemble it in working order during this ninety minute workshop. Participants will learn about lubing and adjusting cables while learning some theory and history. Bring your own three speed as we may be able to help with adjustments. Please note that this is otherwise NOT a hands-on workshop. Price: $20 for Society of Three Speeds members, $25 for non members, plus service charge. Thank you to the Community Cycling Center for giving us the space for this event. Three Speed Day Tour is this Saturday. You going? Hello folks! The Three Speed Day Tour is happening on Saturday April 20th. 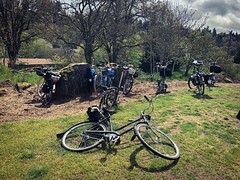 This 25-to-30ish cruise will head down to Oregon City and back. Registration is required, you can register and find the full details here. The long range forecast for Saturday April 20 is good: Slight chance of showers, high 60F. Now things can change between now and then, so…bring your rain cape! Lunch will be in Oregon City, which is about 16 miles in. Adult beverages can also be consumed at this spot. On top of that, there could be another possible coffee (as in coffee shop) stop. This is a leisurely ride! And yes folks, there’s still plenty of space available. Hope you can come! 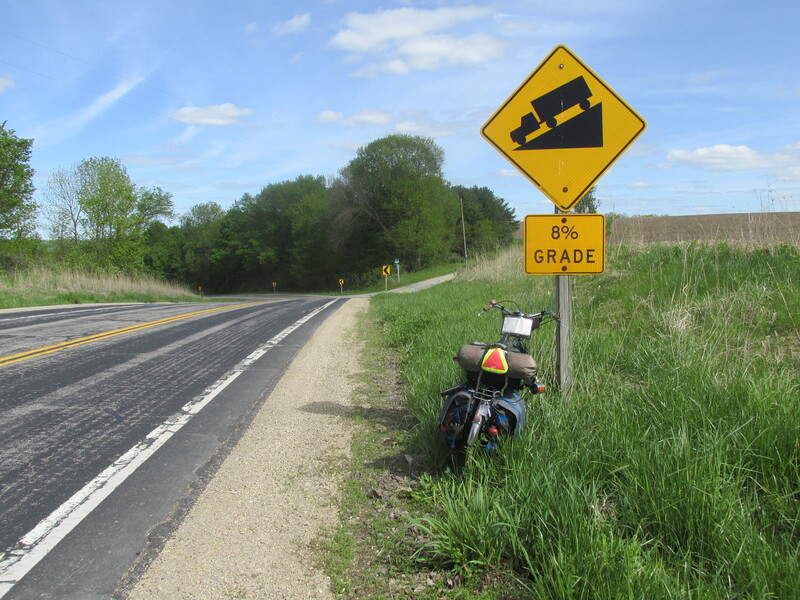 During my tour of Wisconsin in May 2015, I rode a loaded touring three speed up a few hills with 7 to 8% grades! Hello all! So far, I’ve seen the successful completion of the “Climb” challenge by two people: Happy Little Three Speed Bicycle and 3 Speed Seattle. Happy Little Three Speed brought up some points about the challenge, so I just wanted to address them. Let me just review what the Challenge is: A climb of 5% or more grade, with a cumulative elevation gain of at least 100 feet (30 m). I wrote up this particular challenge because there’s the idea that we three speeders don’t like climbing hills. While there’s truth to that, esp. since the lowest gear one can safely get with a three speed is in the high 30’s. * But three speeds can climb! You just can’t spin like on a touring bike. I figured that 5% is the starting point of what many people think is a “real hill” and 100 feet of elevation gain is enough to feel it. Plan A: Find a hill with at least 100 feet of elevation gain, with a grade of 5% or more. Plan C: If A and B don’t work, find a hill of 5% or more grade, and go up (and down) it until you hit 100 feet of cumulative elevation gain. So I’m giving you a few ways you can successfully complete this challenge. Please remember that this challenge must be done during a single ride, you cannot add up cumulative elevation gains from multiple rides. But yes, you can combine this challenge with another challenge! If this challenge happens during a 15 mile (or more) ride, you’ve just knocked off two of them! Make tea at the top? Three. Was there a half-mile of unpaved in there? Four! Was this all on the way to the campground for the night? Grand slam!!!!! Alright folks, you still have about 2/3’s of April to finish. Have questions about the Challenges? Please get in touch! And below is photos from 3 Speed Seattle’s Climbing Challenge. *Yes, I know people have achieved lower. But I’d be scared of destroying the hub below the recommended 2:1 ratio. And I’m not a lightweight person, so it’s probably safer for lighter folks. Hello friends of Three Speeds! Just a reminder that our first workshop, the Sturmey Archer Hub Rebuild Workshop, is just two weeks away. And while we’ve sold half of the spots, we still have space available for you! Hello folks! Three Speed April is just about 1/4 of the way done. As of now, we have about a dozen folks signed up for the challenge. Right now, no one has filled out the Challenge Report form, though I have seen reports online from 3 Speed Seattle and Happy Little Three Speed. Online reports elsewhere are great, of course, but to truly qualify, please remember that you must first sign up for the challenge, and then fill out the reports. All of this is done via Google Forms. (Google Forms auto-saves info, and you can go back in to edit and add more stuff.) So go here to do all that! Remember, if you complete one challenge, you qualify for discounted membership! That’s right, successfully complete one of the five challenges (any one!) and you can get a membership for just $15 plus shipping! So you’ll need to a) register b) complete one challenge and c) report it on the Google Form. This discount is good for the length of the challenge (April 1-30) and must be reported no later than May 31st. Please get in touch with me to get the discounted membership. Prize packs finalized! Just like last year, for every Challenge you complete, you qualify for a one-inch button (badge) for that Challenge! Yes, the buttons are the same as last year, since I still have quite a bit. Why yes, that is a patch! This 2 1/2″ patch is expertly sewn by Falls Creek Outfitters. You can qualify for this patch if you successfully complete three or more of the Challenges. This design will also be made into a 1 1/2″ weather proof sticker (decal). Complete at least one of the challenges to qualify for the sticker! Please note that these prices are in US funds and do not include shipping. I’ve decided to keep it simple with buttons and just offer one flat rate. So it encourages you to do more than one challenge! And I’ll also give you the option to purchase multiples. Price packs will be sent out in June or July, after payment has been received. Okay! Keep on signing up, and keep those updates a-coming!